And pleasantly diffused room lighting. The AMBIENCE cupboard lighting system from LEICHT can be installed without great effort. Directed LED-spots, integrated behind glass fronts at the front edge of the shelves, glare-free illuminating the cupboard niche below. Spring pins at the side of the shelf take hold of the laterally notched conductor rails for connection. All shelves can, as usual, be removed and placed in any desired position. The integration of a particular lighting concept defines the high quality characteristics of the cupboard group whose floor and tall units are available in the depths of 36 and 58 cm. The interior, available in almost all surround accessory colours, is illuminated by the front edge light to the corresponding wooden shelf and the fixed construction shelf. The environment-friendly LED-technology is glare-free and integrated in the stainless steel type metal profile of the shelves. A special contact system with current feed rails in the sides provides individual adjusting of the shelves. 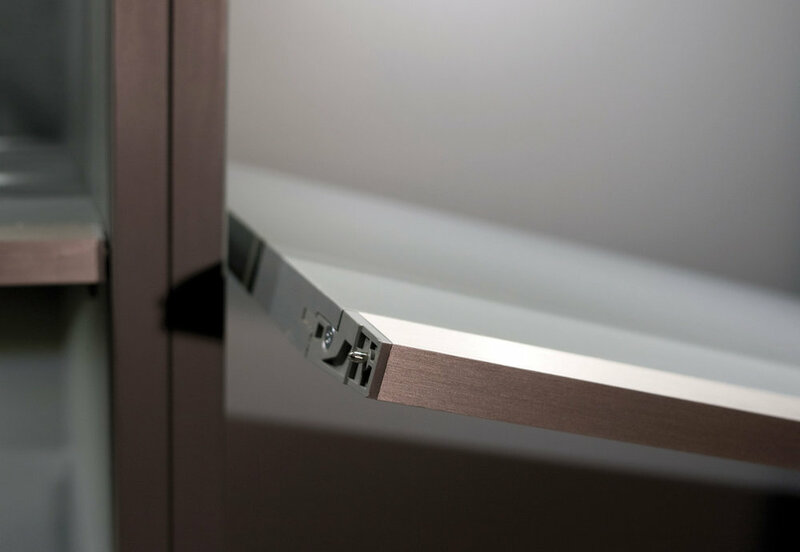 The handle-less Karat glass front with its narrow frame has the ESG-clear glass with rear frame imprint GLR in a neutral metallic colour.